Life is full of settings: your house, school, the park near your home. Every story has one or more settings that are important to the character and the development of the plot. I’ve chosen my fair share of settings, from a fictional kingdom at war to a hospital emergency room full of patients. Planning a good setting can take a lot of trial and error, and a surprising amount of research. 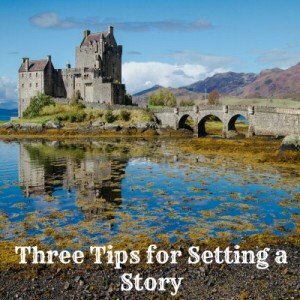 Here are three tips to help you make your setting, and your story, perfect. Adding detail is all about imagery, providing your reader with an image in their mind of what you are describing. Without it, your setting can be bland and insubstantial. Is your story set on the wild moors of Scotland? Then look it up. In order to have a properly detailed setting, you need to know the right facts. Even in a fictional story, there are probably going to be things in your setting that are based on the real world. Imagine that you are writing a story about two woodland fairies who save their forest from an evil spirit. What type of trees surround them? If you write, “Aeva and Roson lived in the tallest baobab tree around and nested in it’s comfy branches at night,” you might want to check out where baobabs come from: Africa! An African Baobab tree isn’t exactly the type of tree that grows in a dense forest. Instead, you could find out which trees actually do grow in these forests, like maple or pine trees. Research is key if you want your story to be well planned and nicely written. From the description, you get to see the setting, the puppy’s new home, through its eyes. This way, not only do you get a description of the setting, but you get some insight into the story’s main character. A good setting takes a lot more than detail, research, and point of view, but these tips will certainly give you a good start on writing an even better story. Good luck, and happy writing.